We have entered the New Age, the Space Age and as Carl Sagan remarked “We are made of star stuff.” With the New Age we understand that we are the sophisticated beholders and receivers of Quantum energy, the force that binds every thing in our universe together and very likely binds us to other universes as well. We can tap into this energy within ourselves and reap the harvest. We can achieve our own potential when we have confidence, imagination and belief. Cynthia Sue Larson's “Quantum Leaps shows us by examples how we can mine the gold within ourselves. Descartes said “I think therefore I am.” Larson extends this observation to “I think therefore I am the way I want to be.” It is mind over matter. She jokes “Fake it 'til you make it.” But that is precisely how our minds react with the sub-atomic fields to create changes in our lives: money, happiness, a great relationship, whatever we desire. We have become in the modern world, in the New Age a sheep in sheep’s clothing , a sheep that is bolder, wiser, perhaps sassier than the lamb we used to be. Many years ago Dale Carnegie and Norman Vincent Peale postulated using our own powers to succeed. Their books “How to stop worrying and start living” (Carnegie 1948) and “You can if you think you can” “ (Peale 1987) and many others by these authors sold in the millions and are still in print. What these two behavior gurus were telling us was to tap into our inner powers, today termed Quantum Leaping or Jumping.in physics at the micro level a quantum jump is the sudden leap of an atom or an electron from one energy level to another. A mind-boggling experiment by an American scientist, Cleve Backster, and described in “Quantum Jumps” may blow you away as it did me. Dr. Backster hitched up a polygraph (Lie Detector) to his “pet” plants, rather than to a human arm. He then went into an adjacent room and some time later thought “I am going to go back to the laboratory where the plants are right now.” At the precise instant of the thought the polygraph pen “squiggled” all over the graph. Whether the plants were over-joyed that the scientist was returning or highly disgruntled would be a hard call., but we really think he made them happy. Plants are phenomenal anyway in the way they employ the energy of the sun to synthesize sugars totally independently. They know which pathways of energy to take under different conditions, sunny, cloudy cold or whatever. They are very competent factories and we must not forget all men are grass.Certain emotions and attitudes for a person to dip into his own resources and successfully quantum jump appear to be necessary and stagnation is the worst enemy for a transformation. Imagination, faith, concentration and determination will get the energy juices flowing and author Larson cites many examples of people Quantum jumping. In a time of need people can create miracles. Author Larson relates the experiences of reality shifters from all walks of life. Along with the various anecdotes she provides practical advice, suggests exercises and answers questions from people who have witnessed what might be a reality shift in their life but are not sure. Hers is a primer for living, for plugging yourself into the Quantum Jump gravy train and attaining a new level of awareness, a new level of being, a new level of happiness. We can flourish when the road ahead is forked and we are confronted with uncertainty, perhaps wrenched this way and that and yet relishing the opportunity to face many possibilities and tackle them head on.Larson mentions the Dalai Lama as being “one of the most upbeat, friendly, positive, joyfulpeople you could hope to meet on this planet.' He is, indeed, and his religion is based on kindness and compassion. China has Tibet in her clutches but bitter the Dalai is not and he does not waste his time with hatred or thoughts of revenge. However, I did hear him once say, with a twinkle in his eye, that the next Dalai Lama would NOT be Chinese!Pope Francis with his warmth and charisma has already become a superstar, but a humble superstar. He and the Dalai Lama are brothers under the skin I do believe. And they are both Reality Shifters without a doubt! “Quantum Jumps” may take you where you've never been before or perhaps you're an old hat at jumping between realities. Either way, this is a sprightly book with difficult concepts explained, a guidebook of “an extraordinary science of happiness and prosperity.” Highly recommended! Wow! I've read other books on the subject of utilizing quantum theory in everyday life, but never one as well researched, and thought out as this one. To be totally honest, I'm kind of on the fence as to the subject of Quantum Jumping. However, I still give this book 5 out of 5 stars, because the author states her case so well, and wrote a very interesting and engaging book. This is a subject I would've had trouble considering 10 years ago, but after becoming involved in Qigong and energy work, along with daily meditation I can see how the concepts Cynthia Sue Larson writes about have the power to create overwhelming positive change in ones world. Another thing that interests me about her work is the subject of the placebo, and nocebo effects. I think these subjects will have a profound effect on the future of all scientific endeavors, but specifically medical and exercise science. Whatever your goals for the future, Quantum Jumps is a fantastic, helpful guide. I'm glad I read it, and am amazed at the immediate results this way of thinking has already manifested for me personally. I am certainly no expert in the realm of Quantum physics; however, in this day and age when the term “quantum” seems to be applied to everything except canned milk, it is refreshing to find a book wherein the word is used in a genuine and relevant manner and Cynthia Sue Larson’s latest book, Quantum Jumps certainly does fulfill the quantum content quota.When the layperson hears the term “quantum” the tendency is probably for them to envision wild-eyed scientists madly covering the classroom chalkboard with indiscernible characters and computations. While this mental image may indeed contain some truth, many people may not realize that the quantum world impacts us every moment of everyday, nor would most people realize that what happens at this subatomic level touches all aspects of our lives.While still in its infancy, the science of the really, really small (quantum physics) is captivating the minds of some of the best minds alive today. The idea that the basic building blocks of everything known and unknown comes from “stuff” we can’t define stretches our understanding of the nature of reality and the universe; however, while Quantum Jumps shares some mind-expanding, as well as some mind bending, concepts, the information is presented in a manner that is respectful of people whose knowledge is limited in this area. Those with no knowledge of quantum physics will not likely be overwhelmed by the information (the first chapter is the most intense, but a deep understanding of these concepts isn’t necessary to get the benefit of later chapters) and those with some exposure to Quantum physics will likely still find new and unique concepts as well.Some of the deeper concepts discussed on the first pages of the book include Quantum Entanglement, Quantum Teleportation, Quantum Tunneling, the Placebo Effect and, of course, how all of these ideas are connected to Quantum Jumps. Regardless of a person's previous exposure to quantum concepts, I think that one of the most intriguing aspects of Quantum Jumps is that it touches on the vast interconnectedness between the quantum world and our observable reality. Certainly there is a healthy smattering of facts, figures and scientific experiments to keep you on your toes, but there are also healthy doses of anecdotal stories and experiences that keep the material at a “human” level. Indeed, one of the greatest gifts that the author gives is that she connects all of the science to the human experience and she provides exercises that everyone can make use of to incorporate quantum jumps into daily life. Cynthia discusses the benefits of taking quantum jumps, she shares the three steps required for a quantum jump to take place, she provides several exercises at the end of each chapter to enhance the quantum jump experience and at the end of the book she gives a list of common questions and their associated answers. With respect to questions and answers, I think it is important to mention that much of what is happening at the quantum level will intrigue and occupy scientists for many years to come, and perhaps some of the “hard” questions will never be explained with the physical, finite tools that we possess. If you are hoping that any book will give the absolute, final word about what is happening in the quantum realm, or if you are the type of person that requires 100% proof of something before you become convinced of its existence, then the realm of the quantum will likely not give you the answers you seek. The good news though is that, as people living in this quantum environment, we don’t necessarily require all of the answers to make use of quantum laws and quantum jumps to increase our quality of life.Cynthia states that, “Quantum Jumps is designed to help you open your mind to new beliefs about the nature of reality, and the range of possible realities you can focus on, energize, and choose to live within.” I believe she has successfully lived up to these words in this book & I appreciate her exuberance and dedication in presenting this material. I love books that make me think outside the box and challenge me to consider alternate points of view and possibilities, and in this case this book truly delivered. But, to tell the truth, it also seriously freaked me out. It made me aware that I quite possibly have been stuck in the wrong dimension for some time, and if truth be told I needed to jump, quickly, into another one because quite frankly this one is sometimes the pits.I also seriously need to commit to completing some of the exercises in the book because I'm intrigued with the idea of jumping into a better version of myself, one that is successful and quite frankly has a better grip on reality. That being said, I'm a natural skeptic, and will need to continue to study this subject more thoroughly. Thank you Cynthia Sue Larson for your easy writing style. I thought this had potential, but soon realized it was just a piece of crap and a complete waste of my time. If, as she states in the book, we can jump into other realities (because it, apparently, happens all the time), I would have loved to jump into a reality where I didn't read this book. More than 100 years ago, the experiments of scientific greats like Max Planck, Albert Einstein, Niels Bohr and Erwin Schrödinger threw some traditionally accepted scientific laws into question. Quantum mechanics defied logic and boggled minds.More than 100 years later, our minds still boggle. We're having some difficulty accepting the possibilities of our Quantum Age, because we resist believing in anything in the absence of hard proof. In Quantum Jumps, Cynthia Sue Larson presents a "radical new paradigm—that we exist in a holographic multiverse in which we can literally jump from one parallel universe to another." I have no doubt many will find it hard to believe. "Quantum jumping is the process by which a person envisions some desired result or state of being that is different from the existing situation—and by clearly observing that possibility and supplying sufficient energy, makes a leap into that alternative reality." (Are you thinking of Scott Bakula in Quantum Leap right now? )The idea isn't new, and we find similar themes in the words of Napoleon Hill, Charles Haanel, and Jesus. ("Ask and it will be given to you." Matthew 7:7) More and more experimental results support the possibilities. Larson includes examples of experiments with drug placebos, weight loss, goal achievement and empathy.Larson outlines three quantum jumping steps:Attain a relaxed, detached and peaceful altered state.Feel energized about your visualized positive outcome.Take positive action in keeping with your new reality.We make "quantum" jumps every day. When we get out of bed and eat our favourite breakfast, for example, we unconsciously complete all three steps; we're just so used to doing it, we don't give it much conscious thought. If it is so easy for us to manifest our breakfast, why not greater things, then?Larson recommends a meditation practice in which we envision ourselves as connected to, and part of, an eternal infinite. The practice might help you lose weight, find a romantic partner, change jobs, ease depression or locate lost objects.I'm grateful to Einstein, Bohr, Planck and others for inviting us into the Quantum Age. I'm encouraged by the ideas Larson presents in her book, even though some of them still felt a little "out there" for my comfort zone. I won't discount them, though. After all, poor old Galileo had no way to prove to the masses that earth revolved around the sun, not the other way around, and he was vilified for his "out there" theory. He died being dead right.Who am I to question the possibilities? Narrative therapy depends on the truth that you change your reality by changing your story about yourself. Here is an example from the story I am currently writing:“‘Without realising it, you’ve been sending out black energy, and people respond to that. You have the power to change that to white energy, and people will respond to that too.’‘Bull... bulldust!’Bill laughed. ‘That was an example. You just blasted a big beam of black energy at me. I expected it, or I’d react with anger. Now, try an exercise. You no longer have a sore throat, your coughing has stopped, and your temperature is normal. From the depth of your heart, without words, thank me.’”Of course, Bill’s client was not sending out any form of energy, but the metaphor got him to act in a more constructive manner. The truth or falsity of the story doesn’t matter, only its consequences do.Cynthia Sue Larson tells us a story about the mechanisms of the universe. There is a great deal of evidence for this conception in subatomic physics. She also tells us many stories, again based on evidence, that demonstrate how people can change their lives in big and little ways. She cites a number of scientists who claim that these macroscopic, life-altering changes are due to quantum jumps.Sorry, Cynthia, I have not bought the connection. Those scientists are only expressing opinions about causation, not evidence.But that doesn’t matter. I love this quote from the book:“Best results will likely be obtained by those who have no beliefs at all. There can be a beautiful balance between intentional, active manifesting -- in which what is desired and expected is clearly envisioned and held firmly in mind -- and in allowing ourselves to receive whatever comes our way” (p 75).I look on this book as a primer for achieving a good life. If you DO the things Cynthia recommends, you will gain immense power over your world. And, as with my little example about black and white energy, the truth of the justifying story is irrelevant. Only its effectiveness matters.So, you can do yourself a favour and learn techniques for improving your life, while enjoying Cynthia’s clear, entertaining, easy-to-follow explanations of some very difficult concepts. If you never could understand physics, now is your chance to make the quantum leap into understanding. I finished reading this book over a week earlier than I expected to, due to an obsessive need to read a little more every couple of hours. It is an excellent interpretation of the Many Worlds Theory in action. I will try to be concise in relating what I liked about Quantum Jumping, and what I would have stressed differently.I came to believe as the Author does many years ago, noticing differences in my world after experimenting with dowsing while maintaining an 'empty mind' walking Zen meditation. I realized that the changes in my world were not so much found as manifested. I would have used the term Shadow or Shadow World Walking instead of Quantum Jumping, because we move to a world where typically, we have changed only one event (at a time), and everything and everybody else in that world are 'shadows' of the former world.I would also have liked the Author to stress that the problem is that our unconscious minds are in control of this process, and it fulfills what it sees as our expectations, not necessarily our desires. While she did not stress this detail, she goes on to teach us all the best ways to make the unconscious mind believe that what we desire is actually what we expect.Despite my minor quibbles with semantics, this is the clearest explanation of the practical side of using the hidden aspect of existence that I have ever read. You will want to keep a copy of this one, so I suggest you buy a printed copy. It will have a prominent place on my reference shelf. What I enjoyed about this book is that it contains a lot of practical exercises that one may use to help them to experience quantum jumps. Some of the exercises even focus on specific areas in your life that you may want to improve, such as your financial situation, for example.I also liked the fact that this book included a lot of information about scientific research that has taken place in the field of quantum physics and in other areas that prove that the phenomenon of parallel universes is not just theory but a true reality.I especially loved reading the stories about other people's experiences with quantum jumps, as many of their experiences reminded me of my experiences of quantum jumps to parallel universes. It is also helpful to read about others' experiences, as it helps us to better understand our own experiences.I recommend the book, "Quantum Jumps", to those who are interested in learning about what quantum jumps are, to those who are interested in learning more about the science behind quantum jumps, and to those who want to begin to experience quantum jumps for themselves. 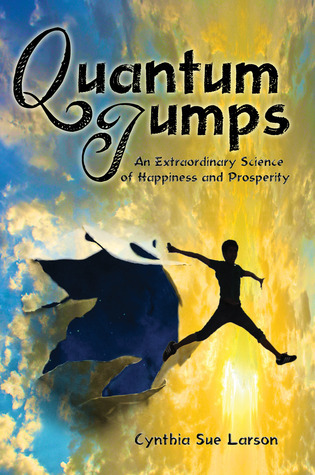 I would also recommend this book to those who have already knowingly experienced quantum jumps, as this book gives good insights about quantum jumping, and it includes many exercises that they may want to try to continue quantum jumping. Having talked with the author who so generously allowed me to SKYPE with her today, I now understand better her intentions for this book and believe she accomplished most of them just fine. A better description of those intentions would help clarify what to expect, and a clearer delineation of what is and isn't an example of a Quantum Jump and WHY would also be helpful to include. A mandatory readingFor everyone willing to improve their lives, take control of their past, present and future and for the ones who suffer from all kind of disease. A huge thank you to the author! A little involved. I like the concepts in this book. Will re-visit this in the future.